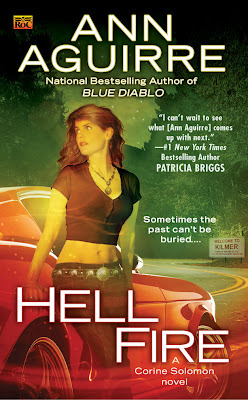 Ann Aguirre has a guest post at Borders Sci-Fi where she talks about the cover art for Hell Fire (April 6, 2010), the second book in her Corine Solomon urban fantasy series following Blue Diablo. She is asking for feedback and is doing a giveaway of the book to a commenter. commitment, at least to my hair. Oh Yeah! Ann Aguirre. One of my favorite writers! Mardel I have Blue Diablo on my TBR stack but still haven't gotten to it. Sigh. It's pretty good. I loved it, and that's the book my puppy chewed a hole through FIVE pages of. Five pages toward the end, right after an intense fight scent. Ann Aguirre sent me (through e-mail) the five missing pages. How many authors would even pay attention to an email asking for replacement pages? I don't think very many. I wasn't sure what to expect, buy my husband said "might as well try, the worst that happens is you get turned down". I'll always have a soft spot in my hard little heard for Ann Aguirre because of that little bit of kindness. Plus she's a hell of a writer! 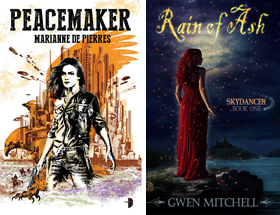 If you haven't yet, you should also read Grimspace and Wanderlust- great space series. Mardel I have actually read Grimspace and quite liked it but that's all I have managed. I've heard nothing but good things about her books. She also drops in here and comments from time to time and is always fun and gracious. It doesn't surprise met that she responded to you. The UF community is amazing.